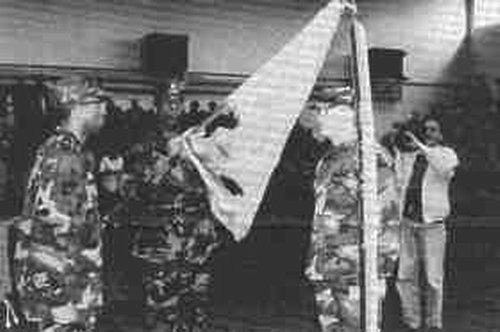 "WILDFLECKEN, THE BEST KNOWN SECRET"
April 15, 1994, is a day that will be recorded in the history books forever, for the last remaining unit stationed at ' the Wildflecken military community, the 283d Base Support Battalion, retired its colors during an inactivation ceremony at the Fitness Center. Included in the plans for the eventful day was an ecumenical service at the Post Chapel, a monument dedication to the Americans by the local national civilian work force, and a friendship fest sponsored by the mayor of Wildflecken, Burgermeister Walter "Pitzi" Gutmann. Overshadowing the day's events was the remembrance of 26 members of Operation Provide Comfort who had lost their lives the day before when U.S. warplanes mistakenly shot down two American helicopters in northern Iraq. Both the German and American flags flew at half staff. Every available seat was filled with approximately 400 Germans and Americans attending the "Service of Gratitude" ecumenical service at the Post Chapel. The 283d Base Support Battalion chaplain, Maj. David Lundell, the 100th Area Support Group chaplain, Col. Ronald W. Benzing, and German chaplains Father Peter Sachi and Father Reiner Fries, led the congregation through songs, prayers and readings from the old and new testament. During Benzing's message, he spoke of the "good news" heard around the world when Germany announced that the Berlin Wall was open and the Cold War was over. Benzing also recognized the Wildflecken Post Chapel as a "monument to good news and change," for the many people who have attended the Chapel services, who have received spiritual counsel, who have had baptisms, weddings, etc., will carry their spiritual experiences in Wildflecken with them as they go to other parts of the world. "Sometimes good news is a mixed blessing," Benzing said. "To the Rhön Mountains and its villages, change has come. Americans will soon be gone. But the good news that has sounded forth from this mountain and from its cathedral will continue forever. It is carried in the souls of men and women, boys and girls, Germans and Americans to the ends of the world. Our God reigns." The congregation was moved to tears at the conclusion of the service when Burgermeister Walter Gutmann played the song titled "Yesterday" on his clarinet accompanied by Wolfram Reidelbach on the piano. Top photo: the 283d Base Support Battalion commander, Lt. Col. Vicente C. Ogilvie begins to roll the battalion's colors for retirement during the inactivation ceremony. Standing to his left is the 283d BSB Command Sgt. Maj. Mark Rudd and to his right is 100th ASG commander, Col. Gary Tobin. 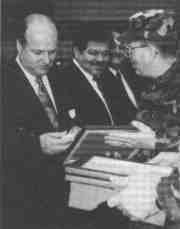 Bottom photo left from front to back: Burgermeisters Walter Gutmann, Hans Rohrmueller and Hans Repp receive the Department of the Army Commander's Award for Public Service from the Commander of the 7th Army Training Command Brig. Gen. Charles Baumann. Bottom right photo: Ruth Ogilvie accepts a bouquet of flowers during the inactivation ceremony. All photos taken by Marilyn Haas.